This ripping blade has a really nice blade with a stunning pattern. 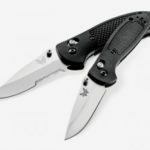 What is so unique about the Junkyard Dog’s blade and why it is so expensive is because this blade utilizes Kershaw’s patented composite blade technology. What this means is that they combine two different types of steels which enable them to work in ways which they perform best. 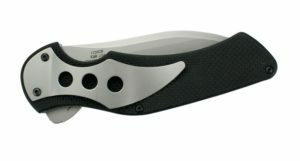 For example, on the Junkyard Dog, they utilize High-quality Sandvik 14C28N stainless steel on the spine and most of the blade as this is a really tough and durable metal that has a high hardness which prevents it from breaking or chipping easily as well as a high level of rust and corrosion resistance. On the cutting edge, the JYD II utilizes my favorite steel, high-chromium D2 Steel. This gives the Junk yard dog and incredibly sharp cutting edge that is unmatched by any other. You will find this blade cutting through materials that once to you ages like it was soft butter, it is truly that sharp. 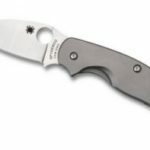 The Junkyard dog’s blade length is a good size at 3 and 5/8 inches long which make it a suitable length for most tasks you put in front of it. 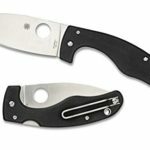 As you would expect with such a high-quality folding knife, the Kershaw Junkyard Dog has a really good handle. What I am really a fan of with this handle is the way that it curves into your palm which gives you this really strong grip and feels as though it is attached to your hand. 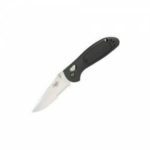 Furthermore, as this is a textured G-10 handle, it is basically nonslip meaning you are not at risk of accidentally losing grip on the handle and cutting your hand open. Another great feature about the knife is that thanks to the liner lock, once the knife is open it will stay open and you are at no risk of it wobbling or closing when in use. My only complaint here would be that it doesn’t have an assisted opening mechanism meaning that you really have to open this blade with two hands. 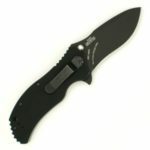 Overall, the Kershaw Junkyard Dog really is a top quality knife. This is the one that I have by my side day in day out and it has always performed the job to the highest of levels. 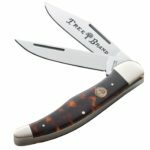 I cannot recommend it enough – sure you may be paying a little more for it, but you are definitely getting your money worth and this blade will last you a lifetime.